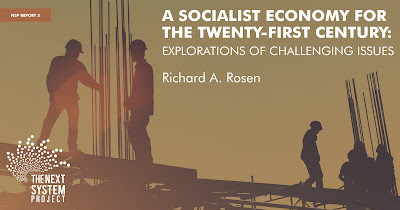 In Next System Project Report 3, author and Tellus Institute co-founder Richard A. Rosen explores the changes he deems necessary for a modern definition of “socialism”, and describes key concepts and issues that arise when aiming to restructure the American economy to include social and environmental sustainability in the Twenty-First Century. To elucidate some of these concepts and issues, Rosen analyzes a set of economic sectors that have very different mechanisms and structures for determining prices, and very different environmental impacts, including: chemical manufacturing, small businesses, housing, defense manufacturing, nonprofit sector, agriculture, and finance. Through these seven-industry sector analyses, Rosen offers a number of changes to each– many of which are also applicable to the economy at large. More specifically, the author proposes a major transition to cooperative and public ownership followed by the adoption of new regulatory structures that are grounded in democratic participation (through Industrial Review Boards); heavily regulated – or even abolished – real estate markets; price and market adjustments that ensure social optimality; the recognition of certain sectors as “public service” in which profit should play no role; and the revival of small towns and cities to attract new farming families and to develop a system of sustainable agriculture across the country. In addition to these proposals, Rosen outlines important lessons from the past. As he points out, one common theme among these sectors is the problematic feature of existing market structures for capital, as well as for goods and services. Consequently, he concludes that when restructuring the economy “markets cannot be the sole or even the major determinant of how we get where we want to go in any economic sector.” Another lesson is the need for new, stricter regulatory standards to ensure environmental protections and to mitigate climate change. 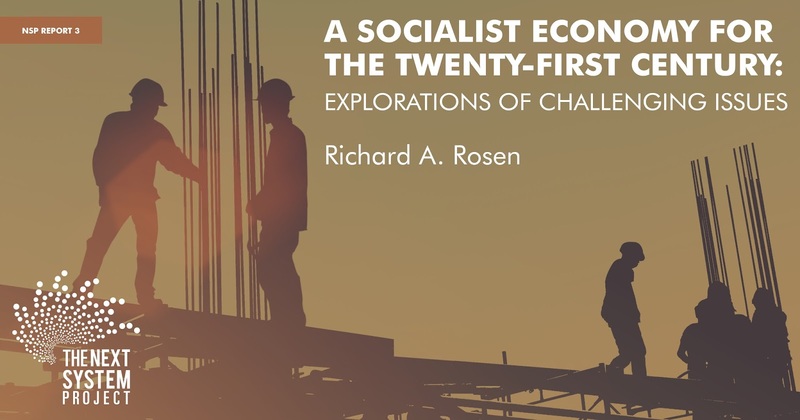 But just as important as Rosen’s proposed changes and lessons learned are the questions the author raises throughout his report to ensure an effective restructure of American economy. In suggesting areas where additional research is required, A Socialist Economy for the Twenty-First Century is a concerted effort to further advance the system change conversation, and presents a framework for thinking about a new economy that takes environmental sustainability and social justice into consideration.